Sargents party pack are a handy snack for the week-end that tastes good but l have had other brands that are better quality,still a good snack at a good price. The Sargents Party Pack are a great quick convenient idea for when the kids friends pop over and you want to give them a quick snack. I’m not too impress with the after taste, not sure if it’s the filling or the pastry, just a bit weird. This isn’t something I buy to eat as a meal, but whenever my daughter plans to have some friends over, I always buy a pack just in case…and they usually get eaten too. This pack is the best for parties and get-togethers, unfortunately it’s not very healthy, but sometimes convenience wins out. I’m not a big pie or sausage roll person but these aren’t bad quality to have now & then. This is our go to for kids parties. these are affordable and yummy. I prefer Sargents over most otger brands. The have quite a good flavour. Not a bad sausage roll, though there are definitely better on the market. I really dont like the after taste that this one leaves you with. 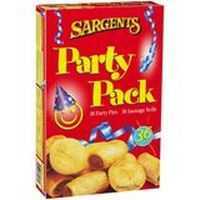 Sargents Party Pack is always good value for parties. They are tasty and hot and filling pastry morsels that everyone loves to eat and eat. How would you rate Sargents Party Pack?